Gordon Howe OC (March 31, 1928 – June 10, 2016) was a Canadian professional ice hockey player. From 1946 to 1980, he played twenty-six seasons in the National Hockey League (NHL) and six seasons in the World Hockey Association (WHA); his first 25 seasons were spent with the Detroit Red Wings. Nicknamed "Mr. Hockey", Howe is often considered the most complete player to ever play the game and one of the greatest of all time. A 23-time NHL All-Star, he held many of the sport's career scoring records until they were broken in the 1980s by Wayne Gretzky, who himself has been a major champion of Howe's legacy. He continues to hold NHL records for most games and seasons played. In 2017, Howe was named one of the "100 Greatest NHL Players". Howe made his NHL debut with the Red Wings in 1946. He won the Art Ross Trophy for leading the league in scoring each year from 1950–51 to 1953–54, then again in 1956-57 and 1962–63, a total of six times, the second most in NHL history. He led the NHL in goal scoring four times. He ranked among the top ten in NHL scoring for 21 consecutive years and set an NHL record for points in a season (95) in 1953, a record which was broken six years later. He won the Stanley Cup with the Red Wings four times and won six Hart Trophies as the NHL's most valuable player. He also led the NHL in playoff points six times. Howe was born in a farmhouse in Floral, Saskatchewan, the son of Katherine (Schultz) and Albert Howe. He was one of nine siblings. When Gordie was nine days old, the Howes moved to Saskatoon, where his father worked as a labourer during the Depression. In the summers, Howe would work construction with his father. Howe was mildly dyslexic growing up, but was physically beyond his years at an early age. Already six feet tall in his mid-teens, doctors feared a calcium deficiency and encouraged him to strengthen his spine with chin-ups. He began playing organized hockey at age eight. 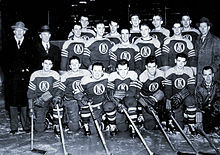 Howe quit school during the Depression to work in construction, then left Saskatoon at 16 to pursue his hockey career. Howe was an ambidextrous player, one of just a few skaters able to use the straight sticks of his era to shoot either left- or right-handed. As a young teen, he played bantam hockey with the King George Athletic Club in Saskatoon, winning his first championship with them in the 1942 Saskatchewan Provincial Bantam Hockey Finals. He received his first taste of professional hockey at age 15 in 1943 when he was invited by the New York Rangers to their training camp held at "The Amphitheatre" in Winnipeg, Manitoba. He played well enough there that the Rangers wanted Howe to sign a "C" form which would have given that club his National Hockey League rights and to play that year at Notre Dame, a Catholic school in Wilcox, Saskatchewan, that was known for producing good hockey players. However, Howe did not feel that was a good fit for him and wanted to go back home to play hockey with his friends; he declined the Rangers' offer and returned to Saskatoon. In 1944, Howe was noticed by Detroit Red Wings scout Fred Pinkney and was invited to their camp in Windsor, Ontario. He was signed by the Red Wings to a "C" form and assigned to their junior team, the Galt Red Wings. However, due to a maximum number of Western players allowed by the league and the Red Wings' preference to develop older players, Howe's playing time with the team was initially limited. However, in 1945, he was promoted to the Omaha Knights of the minor professional United States Hockey League (USHL), where he scored 48 points in 51 games as a 17-year-old. While playing in Omaha, Frank Selke of the Toronto Maple Leafs noticed Howe's rights were not properly listed as Red Wings property. Having a good relationship with Detroit head coach Jack Adams, he notified Adams of the clerical error and Howe was quickly put on the team's protected list. Howe made his NHL debut on October 16, 1946, playing right wing for the Detroit Red Wings, scoring in his first game, at age 18. He wore #17 as a rookie. However, when Roy Conacher joined the Chicago Black Hawks after the 1946–47 season, Howe was offered Conacher's #9, which he would wear for the rest of his career. Although he had not requested the change, Howe accepted it when he was informed "9" would entitle him to a lower Pullman berth on road trips. He quickly established himself as a great goalscorer and a gifted playmaker with a willingness to fight. Howe fought so often in his rookie season that head coach Jack Adams told him, "I know you can fight. Now can you show me you can play hockey?" The term "Gordie Howe hat trick" (consisting of a goal, an assist, and a fight) was coined in reference to his penchant for fighting; however, Howe himself only recorded two such hat tricks in his career, on October 10, 1953, and March 21, 1954. Using his great physical strength, he was able to dominate the opposition in a career that spanned six decades (including one game with the Detroit Vipers of the IHL in 1997). In a feat unsurpassed by any hockey player, he finished in the top five in scoring for 20-straight seasons. Howe also scored 20 or more goals in 22 consecutive seasons between 1949 and 1971, an NHL record. Howe led Detroit to four Stanley Cup championships and to first place in regular-season play for seven consecutive years (1948–49 to 1954–55), a feat never equalled in NHL history. During this time, Howe and his linemates—Sid Abel and Ted Lindsay—were known collectively as "The Production Line", both for their scoring and as an allusion to Detroit auto factories. The trio dominated the NHL in such a fashion that in 1949–50, they finished one-two-three in NHL scoring. This was despite the fact Howe's career prime was during a defensive era, when scoring was difficult and checking was tight. However, as he was emerging as one of the top players in the league, Howe sustained the worst injury of his career - his skull was fractured and his cheekbone and nose were broken after his attempt to check the Toronto Maple Leafs captain Ted Kennedy into the boards went awry during the 1950 playoffs. The severity of the fracture was such that he was taken to the hospital for emergency surgery in order to relieve the pressure on his brain. He missed the rest of the playoffs, but his dominant teammates were still able to win the Stanley Cup. The next season, 1950-51, Howe came back, responding to his severe injuries by playing in every game, by leading the NHL in goals, assists, and total points (86), and by winning the scoring title by 20 points. This was the first year of a four-year period of dominance by Howe which the NHL had never seen before. He won four straight scoring titles and in two of the years (1950–51 and 1952–53) he led the NHL in both goals and assists, which has only been done by five other players in history (a total of 10 times aside from Howe). In three of those years, he led the NHL in goals. In 1952–53, Howe became the first NHL player to score 90 points, finishing the season with 95 points and a career-best 49 goals  which just missed tying the league record of 50 goals held by Rocket Richard (albeit in a 50-game season). Prior to Howe, no NHLer had led the NHL in points more than two times in a row. Only three other players have ever matched the feat of winning four straight scoring titles since—Phil Esposito, Jaromír Jágr and Wayne Gretzky (who won seven in a row). Famous as #9 during his long career, 18-year-old Gordon Howe wore #17 throughout his rookie season of 1946–47. As Howe emerged as one of the game's superstars, he was frequently compared to the Montreal Canadiens' Maurice "Rocket" Richard. Both were right wingers who wore #9, were regular challengers for the league scoring title, and could also play roughly if needed. In Howe's first game at the Montreal Forum as an 18-year-old, he knocked Richard down with a single punch after Richard shoved him. Howe also had a rivalry with the Canadiens' centre Jean Béliveau, who wrote in his autobiography that "trying to strong-arm Gordie off the puck in a corner was akin to wrestling with a telephone pole". The Red Wings and Canadiens faced off in four Stanley Cup finals during the 1950s, and again in the 1966 final; Detroit prevailed in 1952, 1954 and 1955, but Montreal triumphed in 1956 and 1966. After being consistent contenders through the 1950s and early 1960s, the Red Wings began to slump in the late 1960s. When Howe turned 40 in 1967–68, the NHL expanded from 6 to 12 teams and the number of scoring opportunities grew as the game schedule increased. Howe played the 1968–69 season on a line with Alex Delvecchio and Frank Mahovlich. Mahovlich was a scorer, and Delvecchio was a gifted playmaker. The three were dubbed "The Production Line 3", and at age 40, Howe scored 103 points, surpassing 100 points for the only time in his NHL career by scoring 44 goals and a career-high 59 assists. However, following his personal best 103-point season, conflict arose with the Red Wings after Howe discovered he was just the third-highest paid player on the team with a $45,000 salary. While team owner Bruce Norris increased Howe's salary to $100,000, he blamed Howe's wife, Colleen, for the demand. Howe remained with the club for two more seasons, but after 25 years, a chronic wrist problem forced him to retire after the 1970–71 season and he took a job in the Red Wings front office. At the beginning of 1972, he was offered the job as first head coach of the New York Islanders, but declined it. By the end of his NHL career, Howe had won the Hart Memorial Trophy as the NHL's most valuable player six times: 1952, 1953, 1957, 1958, 1960 and 1963 – at that time the most of any player, and as of 2016 second only to Gretzky's nine. He also finished second or third in the voting for the Hart a further six times. Howe was named to the NHL's First All-Star Team 12 times and to the Second All-Star Team eight times. Howe was named an Officer of the Order of Canada in 1971. His number 9 jersey was retired by the Red Wings on March 12, 1972. One year later, Howe was offered a contract to play with the Houston Aeros of the newly-formed World Hockey Association (WHA), which had also signed his sons Mark and Marty to contracts. Dissatisfied with not having any meaningful influence in the Red Wings' office, he underwent wrist surgery to make a return to hockey possible, and he led his new team to consecutive league championships in 1974 and 1975. In 1974, at age 46, Howe won the Gary L. Davidson Trophy, awarded to the WHA's Most Valuable Player (the trophy was renamed the Gordie Howe Trophy the following year). Howe played with the Aeros until 1977, when he and his sons joined the New England Whalers. Gordie was named with sons Mark and Marty to the WHA version of Team Canada for an eight-game series against the Soviet Union. Playing on a line with son Mark and Ralph Backstrom, Gordie contributed seven points in seven games at age 46. The Soviets won the series four wins to Canada's one, and with three ties. In the final season of the WHA, Gordie had the opportunity to play with Wayne Gretzky in the 1979 WHA All-Star Game. The format of the game was a three-game series between the WHA All-Stars against Dynamo Moscow. The WHA All-Stars were coached by Jacques Demers, and Demers asked Howe if it was okay to put him on a line with Gretzky and his son Mark. In game one, the line scored seven points, as the WHA All-Stars won by a score of 4–2. In game two, Gretzky and Mark Howe each scored a goal and Gordie Howe picked up an assist as the WHA won 4–2. WHA also won Game Three to ensure a clean sweep. When the WHA folded in 1979, the renamed Hartford Whalers joined the NHL. While the Red Wings still held Howe's NHL rights even though he had retired eight years earlier, the Whalers and Red Wings reached a gentleman's agreement in which Detroit agreed not to reclaim him. Howe had experienced dizzy spells in the latter part of the 1978–79 WHA season, and underwent an "extensive battery of tests" before deciding to play the 1979–80 NHL season. The 51/52-year-old Howe played one final season, appearing in all 80 games of the schedule and helping his team to make the playoffs by scoring 41 points (15 goals and 26 assists). Late in the season, the Whalers signed Bobby Hull and put Howe, Hull and Dave Keon on the same line. One particular honour came when Wales Conference head coach Scotty Bowman selected Howe, Phil Esposito and Jean Ratelle to the mid-season All-Star Game—which was to take place in Detroit—as a nod to their storied careers before they retired. Howe had played in five decades of All-Star Games and he would skate alongside the second-youngest to ever play in an All-Star Game, 19-year-old Wayne Gretzky. The Joe Louis Arena crowd gave him a standing ovation twice, lasting so long he had to skate to the bench to stop people from cheering. He had one assist in the Wales Conference's 6–3 win. Howe's name and nickname, "Mr. Hockey", as well as his late wife's nickname as "Mrs. Hockey", are registered trademarks. Howe was also referred to during his career as Power, Mr. Everything, Mr. All-Star, The Most, The Great Gordie, The King of Hockey, The Legend, The Man, No. 9, and "Mr. Elbows" (for his tough physical play). Howe was widely considered the most complete player in all of hockey history. Once Howe began dominating the NHL, NHL scouts were given new directives to discover players that played the way he did. Howe's strength, scoring ability, and speed exemplified the perfect example of the modern-day role of a power forward and someone who can play the 200-foot game. Howe's brawn and physical play inspired the coining of the "Gordie Howe hat-trick"—a goal, an assist and a fight—which is now a standard part of hockey's vocabulary. Ironically, Howe himself only achieved his namesake hat-trick twice in his long career, both in the early 1950s, because few players dared to fight him after Howe soundly defeated New York Rangers enforcer Lou Fontinato at Madison Square Garden in 1959. (For comparison, the current leader in Gordie Howe hat-tricks, Rick Tocchet, achieved the feat 18 times in his career.) However, Howe was known for being a well-mannered and trusting person off the ice who never questioned the salary the Detroit Red Wings owners paid him. When it became public knowledge Howe had scored more than 600 goals for the organization before it reluctantly offered to pay him over $40,000, his linemate, Ted Lindsay, began a campaign to establish a player's association to unite for fair wages against the NHL owners. This would be the nucleus of the movement that became the National Hockey League Players' Association. Howe's time playing with the WHA with his sons allowed the fledgling professional league to gain much-needed legitimacy and the ability to fill stadiums. The increased competition for hockey talent forced the insular NHL to seek players beyond its traditional North American sources and recruit professional European players and to expand into new cities to gain new fans. Wayne Gretzky was one of the players who elected to join the WHA instead of the NHL. Over the years, Howe became good friends with Gretzky, who had idolized him as a young player and who would later break many of Howe's scoring records and milestones. While Gretzky surpassed Howe statistically, it was Howe who had first set the standard for consistent, high-level play. 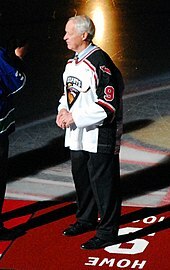 Howe's number 9 has been worn as a tribute to him—Gretzky wore number 99 as a direct tribute to Howe since 9 was taken during the early parts of his career. Another milestone was reached in 1997 when Howe played professional hockey in a sixth decade. He was signed to a one-game contract by the Detroit Vipers of the International Hockey League and at age 69, made a return to the ice for one shift. In so doing, he became the only player in hockey history to compete in six different decades at the professional level, having played in the NHL, WHA and IHL from the 1940s to 1990s. Howe's No. 9 banner hanging in Joe Louis Arena. Howe's first 20 seasons came during an era when the schedule was only 70 games, scoring was difficult, and checking was tight; he never scored 50 goals in a single season. Despite the fact Howe is currently fourth on the NHL's all-time points list with 1850 total points 801 goals, and 1,049 assists, after Wayne Gretzky, Mark Messier and Jaromír Jágr. Howe is still second on the all-time goals list, with only Gretzky ahead of him. When career regular season goals from both the NHL and the WHA are combined, he ranks first in goals with 975, ahead of Gretzky's 940. At the time of his retirement, Howe's professional totals, including playoffs, for the NHL and WHA combined, were first. He finished with 2,421 games played, 1,071 goals, 1,518 assists, and 2,589 points. However, Gretzky would later pass him in goals (1,072), assists (2,297) and points (3,369), but not in games played or games played with one team. After Howe's death, Gretzky called Howe "the greatest hockey player ever", and said that if it were up to him Howe's No. 9 would be retired for all NHL teams the same as his own No. 99. Howe played internationally on one occasion, at the 1974 Summit Series. In the 1986 film Ferris Bueller's Day Off, the character Cameron Frye wears Howe's Red Wings jersey throughout most of the film, even though it is set in Chicago. Howe had provided one to the filmmakers personally. In 1993 a statue created by Michael Martin of Eston, Saskatchewan was installed across from Midtown Plaza and then moved to what is now SaskTel Centre in 2005. Following his death, Howe's ashes along with wife Colleen were interred below the statue. In May 2015, Canadian Prime Minister Stephen Harper and Michigan Governor Rick Snyder announced that a new international bridge spanning the Detroit River would be named in honour of Howe. The Gordie Howe International Bridge is set to open in 2020. On June 27, 2016, it was announced that a bridge in his hometown of Saskatoon would be named after Howe. He was awarded the Order of Canada by the Governor General of Canada, Queen Elizabeth II's representative in the country. Howe was named to Canada's Sports Hall of Fame in 1975. In 1998, The Hockey News released their List of Top 100 NHL Players of All Time and listed Howe third overall, behind Wayne Gretzky and Bobby Orr. Of the list, Gretzky and Orr were quoted as regarding Howe as the greatest player. In 2000, Howe was inducted into Canada's Walk of Fame. On April 10, 2007, Howe was honoured with the unveiling of a new bronze statue in Joe Louis Arena, where the West Entrance is named the "Gordie Howe Entrance" in his honour. The statue is 12 feet (3.7 m) tall and weighs about 4,500 pounds (2,000 kg). The statue contains all of Howe's stats and history. Another statue of Howe was erected in downtown Saskatoon, Saskatchewan, on the corner of 20th Street and 1st Ave. He is depicted wearing a Detroit Red Wings sweater. The statue has since been relocated to the SaskTel Centre. In February 2011, various groups proposed naming the New International Trade Crossing bridge, a proposed bridge that will connect Detroit and Windsor by linking Highway 401 in Ontario with Interstate 75 and Interstate 94 in Michigan, in honour of Howe. On May 14, 2015, during an event attended by Canadian Prime Minister Stephen Harper, it was officially announced that the bridge would be known as the Gordie Howe International Bridge. Canadian actor Michael Shanks portrayed Howe in the Hallmark movie Mr. Hockey: The Gordie Howe Story. The film aired April 28, 2013, on CBC and on the Hallmark Channel in the US on May 5. After the death of his wife, Colleen Howe in 2009, Howe turned his charitable activity towards degenerative diseases such as dementia and Alzheimer's, and founded the Gordie and Colleen Howe Fund for Alzheimer's, in partnership with the University of Toronto's aging and brain health facility at Baycrest Health Sciences. Howe met his wife, Colleen (née Joffa), at a bowling alley when she was 17 years old, and they were married four years later on April 15, 1953. A middle school in Abbotsford, British Columbia, is named after Gordie and Colleen Howe, and a traffic bridge, campground, and football stadium are named after Gordie Howe in his hometown of Saskatoon, Saskatchewan. Two of their sons, Marty and Mark, were his teammates on the WHA Houston Aeros and the New England (WHA)/Hartford (NHL) Whalers. Mark had a long NHL career, playing 16 seasons for the Hartford Whalers, the Philadelphia Flyers, and the Red Wings, and was one of the dominant two-way defencemen of the 1980s. He followed his father by being elected to the Hockey Hall of Fame in 2011. Their third son, Murray, is a radiologist in Toledo, Ohio, and only daughter, Cathy, lives in Lubbock, Texas. Colleen Howe was one of the founders of the Detroit Junior Red Wings and represented both Gordie and Mark financially during their careers. She died in 2009 at age 76 after a long battle with Pick's disease. Howe's younger brother, Vic Howe, also played in the NHL appearing in 33 games with the New York Rangers between 1950 and 1955. He died at age 85 in Moncton, New Brunswick, on January 31, 2015. Due to dementia, Howe spent most of his time after his wife's death residing with all four of his children on a rotating basis. While staying at his daughter's home, he suffered a major stroke on October 26, 2014. He died on June 10, 2016 at his son Murray's house in the Toledo suburb of Sylvania, Ohio at the age of 88. No cause was given. Howe's casket was brought to Joe Louis Arena, the home of the Detroit Red Wings, for a public visitation on June 14, 2016 that lasted from 9 a.m. to 9 p.m. in honour of the #9 that Howe wore on his jersey. Wayne Gretzky, Scotty Bowman, and Detroit Tigers great Al Kaline acted as pallbearers. Howe's funeral, which was also opened to the public, was held on June 15, 2016 at Detroit's Cathedral of the Most Blessed Sacrament. Howe's cremated remains, along with those of his wife Colleen, were returned to Canada for the last time and interred in Saskatoon in September 2016, at the base of his statue outside of SaskTel Centre. Howe was appointed as an Officer of the Order of Canada on June 25, 1971. This gave him the post-nominal letters "OC" for life. He was awarded the Canadian version of the Queen Elizabeth II Silver Jubilee Medal in 1977. He was awarded the 125th Anniversary of the Confederation of Canada Medal in 1992. The Howe family received the Wayne Gretzky International Award major contributions to the growth and advancement of hockey in the United States in 2000. He was awarded the Canadian version of the Queen Elizabeth II Golden Jubilee Medal in 2002. He was awarded the Canadian version of the Queen Elizabeth II Diamond Jubilee Medal in 2012. He was awarded the honorary degree of Doctor of Laws from the University of Regina in spring 1997. He was awarded the honorary degree of Doctor of Laws from the University of Saskatchewan on June 3, 2010. Gordie Howe was specifically honoured by then US President Barack Obama in his speech in the House of Commons Chamber in the Parliament of Canada on June 29, 2016 when Obama stated that "as Americans, we, too, celebrate the life of Mr. Hockey himself, the late, great Gordie Howe." First player to reach 1,500 games played in NHL history. ^ Howe, Gordie (2014). Mr Hockey: The Autobiography of Gordie Howe. Penguin Canada. p. 31. ISBN 978-0-14-319280-0. ^ a b c d e f g h i j k Sinclair, Ron (June 10, 2016). "Gordie Howe dies at 88". CBC Sports. Retrieved June 12, 2016. ^ a b c d "Players: Gordie Howe Biography". Hockey Hall of Fame. Retrieved June 26, 2013. ^ "100 Greatest NHL Players". National Hockey League. January 1, 2017. Retrieved January 1, 2017. ^ "Gordie Howe: A Childhood On The Canadian Prairie". JRank. Retrieved June 11, 2016. ^ a b c d e f g h i j k Dryden, Steve (1998). The Top 100 NHL Players of All Time. Toronto: Transcontinental Sports Publishers. pp. 26–32. ISBN 0-7710-4175-6. ^ a b MacSkimming, Roy (2003) . "Chapter 1". Gordie: a hockey legend (2nd ed.). Greystone Books. p. 14. ISBN 1-55054-719-4. ^ Diamond, Dan (2001). 'Hockey Stories on and off the Ice'. Andrews McMeel Publishing. p. 65. ISBN 0-7407-1903-3. ^ Howe, Gordie (2014). Mr. Hockey: My Story. New York: G.P. Putnam & Sons. pp. 49–52. ^ "Gordie Howe, 'Mr. Hockey,' turns 85 years old". National Hockey League. Retrieved January 22, 2014. ^ Marek, Jeff (November 2, 2007). "How many Gordie Howe hat tricks did Mr. Hockey notch?". Canadian Broadcasting Corporation. Retrieved March 30, 2008. ^ Marek, Jeff (October 29, 2008). "The mystique of the Gordie Howe hat trick". Canadian Broadcasting Corporation. Archived from the original on July 20, 2009. Retrieved March 31, 2013. ^ a b "Howe, Gordie: Biography; Honoured Player". Legends of Hockey. Retrieved December 13, 2015. ^ National Hockey League (2006). NHL Official Guide & Record. Dan Diamond & Associates. p. 185. ^ "Written History: 1950s". Detroit Red Wings. Retrieved November 17, 2014. ^ Krupa, Gregg (June 10, 2016). "Howe, Orr, Gretzky best of best in NHL history". The Detroit News. Retrieved June 10, 2016. ^ "NHL 1950-51 League Leaders". hockeydb.com. Retrieved June 10, 2016. ^ Reid, Scott (November 21, 2014). "Like one of his punches, Howe has made an indelible impact". The Orange County Register. Southern California News Group. Retrieved December 5, 2018. ^ "Gordie Howe, Jean Béliveau rivalry grew into friendship". Canada.com. Postmedia News. June 10, 2016. Retrieved December 5, 2018. ^ "NHL Hart Memorial Trophy Winners". Hockey-Reference. Retrieved June 10, 2016. ^ "Gordie Howe, ice hockey star, obituary". The Daily Telegraph. London. June 10, 2016. Retrieved June 10, 2016. ^ a b Frisk, Adam (June 10, 2016). "Gordie Howe dead at 88". Global News. Retrieved June 10, 2016. ^ "Retired Jerseys: Gordie Howe". Detroit Red Wings. Retrieved June 10, 2016. ^ a b "Remembering 1974". International Ice Hockey Federation (IIHF). Retrieved June 11, 2016. ^ a b c Willes, Ed. The Rebel League: The Short and Unruly Life of the World Hockey Association. Toronto: McLelland and Stewart. p. 221. ISBN 0-7710-8947-3. ^ Gaschnitz, K. Michael (2003). The Edmonton Oilers. McFarland. p. 262. ISBN 9780786455461. ^ "Decision to play rest solely with Howe". Saskatoon Star-Phoenix. S-P Services. September 22, 1979. p. A12. Retrieved October 11, 2013. ^ "Mr. Hockey". gordiehowe.com. Retrieved June 26, 2013. ^ McGourty, John (March 30, 2008). "Detroit honors 'Mr. Hockey' at 80". National Hockey League. Retrieved January 26, 2015. ^ Vancouver, The (March 15, 2008). "Howe Gordie did it". Canada.com. Archived from the original on November 4, 2012. Retrieved June 7, 2011. ^ a b c d e f Cole, Cam (June 12, 2016). "Gordie Howe impacted the game of hockey like no other". Toronto Sun. Retrieved June 12, 2016. ^ "Gordie Howe Hat Trick: Career GHHTs: Rick Tocchet". gordie-howe-hat-trick.blogspot.ca. Retrieved June 28, 2016. ^ "Gordie Howe, 'Mr. Hockey' for the Red Wings, Dies at 88". The New York Times. June 10, 2016. Retrieved June 11, 2016. ^ "Howe Becomes First to Skate Six Decades". Eugene Register-Guard. Associated Press. October 4, 1997. Retrieved June 10, 2016. ^ Amber, David (March 31, 2008). "As Howe turns 80, we celebrate Mr. Hockey's storied moments". ESPN. Retrieved June 11, 2016. ^ Russell, Andrew (June 10, 2016). "Gordie Howe: Here's how Wayne Gretzky honoured his hockey hero in 2015". Global News. Retrieved June 10, 2016. ^ Ippolito, Casey (June 10, 2016). "25 years ago today, Wayne Gretzky broke the all-time scoring mark in astounding fashion". The Hockey News. Retrieved June 10, 2016. ^ Clinton, Jared (June 15, 2016). "Wayne Gretzky thinks No. 9 should be retired league-wide in honor of Gordie Howe". Retrieved July 6, 2018. ^ McDermott, John (June 11, 2016). "Why Cameron Frye Wore a Gordie Howe Jersey in 'Ferris Bueller's Day Off'". MEL Magazine. Archived from the original on August 12, 2016. ^ Markazi, Arash (May 5, 2009). "Q&A with Gordie Howe". Sports Illustrated. ^ Mitchell, Kevin (June 18, 2016). "The rough 'n tumble tale of Gordie Howe's statue". Saskatoon StarPhoenix. Postmedia Network Inc. Retrieved December 5, 2018. ^ Roose, Bill (May 14, 2015). "New international bridge to honor Howe". Detroit Red Wings. Retrieved May 14, 2015. ^ "Saskatoon City Council unanimously votes to rename bridge after Gordie Howe". CBC News. June 27, 2016. Retrieved June 29, 2016. ^ "Honoured Member Stories: Gordie Howe". Canada's Sports Hall of Fame. Retrieved June 10, 2016. ^ "How Wayne Gretzky Earned His Nickname". Youtube.com. The Late Show with Stephen Colbert. Retrieved December 5, 2018. ^ "Bronze statue of 'Mr. Hockey' unveiled in Detroit". ESPN. Associated Press. April 11, 2007. Retrieved November 17, 2014. ^ "A statue of Gordie Howe is shown in Saskatoon on April 4, 2016". Edmonton Journal. April 4, 2016. Archived from the original on August 8, 2016. Retrieved June 11, 2016. ^ Kraniak, Dennis (February 4, 2011). "The Gordie Howe International Bridge". Detroit: WJBK-TV. Archived from the original on July 14, 2011. Retrieved February 5, 2011. ^ "Gordie Howe International Bridge to connect Windsor and Detroit". CBC News. May 14, 2015. Retrieved May 14, 2015. ^ "Mr. Hockey: The Gordie Howe Story". Hallmark Channel. Retrieved June 10, 2016. ^ "Mark Howe's journey all his own". ESPN. November 11, 2011. Retrieved June 11, 2016. ^ Trister, Noah (October 28, 2014). "Hockey great Gordie Howe resting at daughter's home after stroke". The Globe and Mail. Toronto. Retrieved June 11, 2016. ^ "The Gordie Howe you don't know". Detroit Red Wings. March 28, 2008. Retrieved June 10, 2016. ^ "Death of Colleen Howe". CTV. Retrieved June 7, 2011. ^ "Vic Howe, brother of hockey legend, dies at 85". National Hockey League. ^ Krupa, Gregg (October 28, 2014). "Wings great Gordie Howe resting after 'serious stroke'". The Detroit News. Retrieved October 29, 2014. ^ "Gordie Howe resting after stroke: report". National Hockey League. October 28, 2014. Retrieved October 29, 2014. ^ Beam, Todd (December 19, 2014). "Family issues update on Gordie Howe". National Hockey League. Retrieved December 19, 2014. ^ "Gordie Howe makes 'amazing' recovery following stem cell treatment in Mexico". ProHockeyTalk. NBC Sports. December 19, 2014. ^ Fikes, Bradley J. (December 26, 2014). "Did stem cells really help Gordie Howe?". U-T San Diego. ^ "Hockey legend Gordie Howe's recovery highlights stem-cell advances". Toledo Blade. Retrieved December 13, 2015. ^ "Gordie Howe Dies, Red Wings Confirm". CBS Detroit. June 10, 2016. Retrieved June 10, 2016. ^ a b "Gordie Howe visitation draws thousands". CBC Sports. Associated Press. June 14, 2016. Retrieved June 14, 2016. ^ Strong, Gregory (June 14, 2016). "Fans stream in to pay tribute to Gordie Howe". Toronto Star. The Canadian Press. Retrieved June 15, 2016. ^ "Gordie Howe's ashes laid to rest in Saskatoon". CBC News. September 26, 2016. Retrieved September 26, 2016. ^ General, The Office of the Secretary to the Governor. "The Governor General of Canada". Retrieved June 12, 2016. ^ "Wayne Gretzky International Award". U.S. Hockey Hall of Fame. Retrieved March 19, 2018. ^ "Honorary Degree Recipients – Registrar's Office, University of Regina". Retrieved June 12, 2016. ^ "Honorary Degrees – University of Saskatchewan". Retrieved June 12, 2016. ^ "Remarks by President Obama in Address to the Parliament of Canada". whitehouse.gov. June 29, 2016. Retrieved November 14, 2017. ^ a b c Frederick, Shane (2013). The Ultimate Collection of Pro Hockey Records. Capstone Press. pp. 24–25. Wikimedia Commons has media related to Gordie Howe.